Following on from their success with the Fleet Review Spectacular, this New Year’s Eve it’s ABC TV that is the official broadcaster of the iconic Sydney New Year’s Eve fireworks, live from Sydney Harbour. It will air on ABC1 at local times, but both the family and midnight fireworks can be seen Live nationally on ABC News 24. New Year’s Eve 2013 will be a four-hour television event presented by ABC Sport’s Stephanie Brantz and ABC2’s Dirty Laundry Live host Lawrence Mooney and will capture all of the colour and excitement of the City of Sydney’s New Year’s Eve celebrations. The broadcast will also feature a cast of much-loved ABC stars and characters, including Richard Roxburgh (Rake), Shaun Micallef (Mad as Hell), Michaela Banas (Upper Middle Bogan), Craig Mclachlan (Doctor Blake’s Murder Mysteries), Annabel Crabb (Kitchen Cabinet), Margaret And David (At The Movies), the cast of comedy series The Moodys, the teams from The Chaser, Gruen Planet and the new Spicks And Specks, plus many more. The New Year’s Eve 2013 broadcast starts on Tuesday December 31 at 8.30pm on ABC1* with a live performance by Pete Murray and an official ‘Acknowledgment of Country’ and we’ll meet the man behind the events, Creative Ambassador Reg Mombassa. The younger viewers are in for a treat when their favourite stars from ABC3 and ABC4Kids including Giggle And Hoot and the teams from Good Game and Studio 3 party on with the 9pm Family Fireworks Display. ABC3 star Kayne Tremills will take in the sights and sounds of the city as a roving reporter and we’ll cross to Brisbane and Melbourne to take a look at the events in those cities. There will be live performances by Iota and Stonefield, plus comedian Sammy J and Randy and an irreverent Year in Review, looking back at the events that shaped 2013. *ABC1 broadcast delayed to local times. ABC News 24 will broadcast both the 9pm Family Fireworks Display and the Midnight Fireworks Display live AEDT. 8.30pm Opening welcome – Lawrence Mooney and Stephanie Brantz. “The next change that will occur when ABC News 24 launches, at which time the ABC1 HD channel 20 will be taken off air”. How do the rights get assigned? Do they bid? I know it’s been on Channels 9 and 10 from what I recall, and perhaps now analogue is switched off it should be broadcast on an HD channel. @laurie: Just because ABC24 is an HD channel doesn’t mean the content is. Same goes for GEM, 7mate and One… most of their content is SD that is just converted for HD broadcast but it isn’t actual HD. Thank goodness nine does not have the rights anynmore .i hated nine coverage . nine did a terrible job with all those add breaks we missed too much of the event at least ABC will be add free. How did Nine lose the rights? It wasn’t rating enough? Or didn’t they bother to bid for the rights? I would have thought Ten would have jumped at the chance and given us wall to wall promos for the Sochi Winter Olympics. @Shoudy Chen – What’s “so sad” about it? The end transmission may well be 720p, but all vision on ABC News 24 is upconverted from SD. There has been no native HD on ABC TV since early 2010 when ABCHD was closed down. @Shoudy Chen – you wouldn’t rather see the whole thing uninterrupted and ad-free? How much are Channel Nine paying you to write that? Wow. 3.5 hours pure entertainment without ad breaks. I’m up for that! Sounds like a great event. I’ll be watching for sure. A Jules Lund free New Years? My Xmas wish has come true! OMG. ABC has the best fireworks in the world? Cool. No ads! No Richard Wilkins! 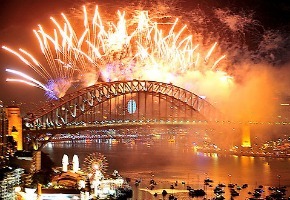 Sad to see Channel 9 lose rights for the NYE fireworks for this year. Ahhhh..No endless promos for The Block, Big Brother, AGT, Cricket, MasterChef, Biggest Loser, My K Rules, X-Factor, Tennis, plus a few hundred commercials. Thanks ABC.